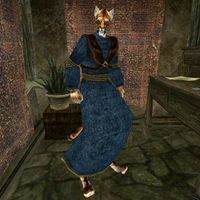 Ajira is a Khajiit alchemist and an Associate of the Mages Guild. Ajira can be found in the alchemical storeroom on the lower level of the Balmora Guild of Mages, behind her desk and near the guild guide, Masalinie Merian. Ajira starts by offering relatively simple first line quests for the Mages Guild which generally involve gathering various ingredients from the Bitter Coast and Ascadian Isles for her alchemical exploits. Her quests also involve her bet with Galbedir on who will reach Journeyman rank first, which allows you to easily steal loot worth more than 60k from Galbedir. Her later quests become far more difficult, involving the acquisition of extremely valuable artifacts. Ajira sells ingredients, potions, and alchemy supplies, and also offers minor training in Alchemy, Conjuration, and Enchant. She is a restocking vendor of the following ingredients: Black Anther, Comberry, Crab Meat, Heather, Hound Meat, Kwama Cuttle, Scales, Small Kwama Egg and Willow Anther. In addition to her restocking supply of alchemy ingredients, she carries and wears extravagant pants, a common robe, and an expensive amulet. Being Khajiit, Ajira is one of several merchants who will buy moon sugar and skooma. "What brings you to Ajira's shop? Do you want duties from Ajira? Do you want the local brews? Or help in a fight? Some Telvanni bug musk? Or a way to reach the high places?" "Has %PCName found the mushrooms Ajira needs?" "Has %PCName put the fake soul gem in Galbedir's desk?" "Does %PCName have flowers for Ajira?" "Ajira must study these flowers and mushrooms. %PCName knows this. Why does %PCName pester Ajira now?" "Ajira must find her stolen reports!" "Has %PCName found Ajira's stolen reports?" "What can Ajira do for %PCName?" "Ajira knows that %PCName is a good friend of Ajira." "Ajira has some duties for Ajira's good friend, %PCName." "Ajira is a good friend of %PCName and tells %PCName about the Staff of Magnus." "Ajira is a good friend of %PCName and tells %PCName about the Warlock's Ring." "Ajira made a bet with Galbedir that Ajira would be a Journeyman before Galbedir. Now Ajira must study these mushrooms and write a report. Ajira wants you to give Galbedir a fake soul gem." "Now Ajira will win the bet with Galbedir." "Ajira won the bet. Ajira does not forget your help." bungler's bane: "Bungler's Bane grows on trees and sometimes other things. It looks like the tree has brown shelves. Ajira warns you not to eat Bungler's Bane." [10 Gold has been added to your inventory] "Yes, take these 10 drakes and go find Ajira a ceramic bowl. Ajira thinks Ra'Virr the trader here in Balmora has some." "Yes, Ajira needs a ceramic bowl." "Yes, Ajira needs a ceramic bowl. Did you find one for Ajira?" Yes, here it is. : [Disposition +5; Ceramic Bowl has been removed from your inventory] "Yes, good. This is an [sic] very good bowl. Ajira thanks you." "Ajira has enough mixing bowls for now." "Nevermind then. Ajira must find her stolen reports!" "Yes, Ajira has duties for you. Before Ajira can be a Journeyman in the Mages Guild, Ajira must study local mushrooms." "Yes, Ajira has more duties for %PCName. Ajira made a bet with Galbedir..."
"Has %PCName done what Ajira asks with the fake soul gem?" "Ajira must now study local flowers." "Ajira is very sorry. Ajira has much work to do on these reports so Ajira can win her bet with Galbedir. Maybe you can fetch a new ceramic bowl for Ajira?" "Ajira knows many secrets, but they are not yet ready for friend %PCName. Speak with Ajira again when you are a Warlock. Ranis Athrys here may have duties for you, but Ajira does not like Ranis much. Maybe you should speak with Ajira's good friend Edwinna Elbert at the Guild of Mages in Ald'ruhn." "Ajira has no duties for friend %PCName, but she is ready to tell you a secret. Ajira knows all about the Staff of Magnus." "Ajira will tell friend %PCName another secret. Ajira also knows about the Warlock's Ring." "Ajira has told you her secrets. What can Ajira do for friend %PCName?" [Fake Soul Gem has been added to your inventory] "Ajira has made a fake soul gem. Take it and put it in Galbedir's desk upstairs. Galbedir should be coming downstairs to talk with Marayn Dren, so no one will see you do this thing." "Take the fake soul gem Ajira gave you and put it in Galbedir's desk upstairs. Hurry before Galbedir returns." [Disposition +10] "You have put the gem in the desk as Ajira asked? Ajira thanks you." "Yes, Ajira thanks you again." "Yes, Ajira must study flowers now. Ajira needs samples of Gold Kanet, Stoneflower Petals, Willow Anther, and Heather. These can all be found on the shores of Lake Amaya." "Do you have the flowers that Ajira wants?" "Do not lie to Ajira. Ajira needs Gold Kanet, Stoneflower Petals, Willow Anther, and Heather. You do not have all that Ajira needs." [Disposition +10; Gold Kanet has been removed from your inventory; Stoneflower Petals has been removed from your inventory; Willow Anther has been removed from your inventory; Heather has been removed from your inventory; 6 Cheap Restore Magicka has been added to your inventory] "Yes, these are the flowers that Ajira needs. Ajira has made more potions for you. Ajira hopes that you will use them well." "You already brought them to Ajira." No, not yet. : "Ajira must make Journeyman before Galbedir. Ajira must have those flowers very soon or Ajira might forget that [sic] good things you've done and ask Ajira's good friend Bribanne Erien to bring her the flowers." Foyada Mamaea: "Foyadas are valleys made by lava from Red Mountain. Foyada Mamaea is very old, very easily recognized. An old Dwemer bridge crosses the Foyada near Fort Moonmoth." gold kanet: "Gold kanet grows near rocks. It has yellow flowers and broad dark-green leaves. The leaves are spiny, so Ajira warns you not to touch the leaves." heather: "Heather has needles like the trees in Skyrim and High Rock, but it grows near the ground and has pink flowers." help in a fight: "Ajira sells potions of restore health for when you are bleeding. And potions of restore fatigue for when you are weary." high places: "Yes, Ajira knows. You have the… What do you call it? The curiosity? Yes, Ajira likes to reach all the high places, too. And Ajira has just the potion for you. A potion of rising force." hypha facia: "Hypha Facia looks much like Bungler's Bane and grows like a shelf on trees and other things. Hypha Facia is safe to eat, but make sure it is not Bungler's Bane." Lake Amaya: "To get to Lake Amaya, go southeast out of Balmora, past Fort Moonmoth. Then follow the signs and take the road to Pelagiad. After you cross the Foyada Mamaea, go towards Suran at the next crossroads. All the flowers Ajira needs are near the path to Suran which runs along the north shore of Lake Amaya." local brews: "Yes, Ajira sells mazte, flin, and sujamma. They make you as strong as a kagouti and half as smart. Puts hairs on your face." luminous russula: "Russula comes from a short, smelly toadstool which is brown on top." "To finish Ajira's report, Ajira needs samples of Luminous Russula, Violet Coprinus, Bungler's Bane, and Hypha Facia. Ajira knows you can find all these on the Bitter Coast. The easiest way is go south along the RiverOdai until you see a wooden bridge across the river. Get out of the river there and find a path west over the hills." "Do you have samples of all the mushrooms? Luminous Russula, Violet Coprinus, Bungler's Bane, and Hypha Facia?" "Where are these samples? Ajira does not see all four samples." [Disposition +10; Bungler's Bane has been removed from your inventory; Hypha Facia has been removed from your inventory; Violet Coprinus has been removed from your inventory; Luminous Russula has been removed from your inventory; 4 Cheap Restore Health has been added to your inventory] "Yes, these are all good samples. Now Ajira can write the report and be a Journeyman of the Mages Guild. Ajira has made potions for you to take in return. Ajira is no great alchemist yet, but Ajira thinks you can use these." "Ajira thanks you again for bringing her the samples." No, not yet: "Please hurry, %PCName. Ajira wants to be Journeyman very soon." Odai: "The Odai is the river here in Balmora. Goes right through middle of town." "Ajira knows the Staff of Magnus is in Assu. It is a cave on the slopes of Mount Kand just northwest of Molag Mar." "Have you found the Staff of Magnus? Ajira does not want it for herself. Just bring it to Ajira and let Ajira see it." "Ajira knows you have found the Staff of Magnus. Now Ajira might tell you her other secret." "Ajira needs your help very badly. Galbedir stole Ajira's reports on the properties of local mushrooms and flowers. Ajira knows Galbedir did not leave the Mages Guild, so the reports must be nearby." "Have you found Ajira's reports?" "Ajira does not see the reports. Bring the reports to Ajira." "Ajira sees you have only one report. Ajira must have both her reports to be a Journeyman." [Disposition +10; Ajira's Mushroom Report has been removed from your inventory; Ajira's Flower Report has been removed from your inventory; Exclusive Potion of Fire Shield has been added to your inventory; Exclusive Frost Shield has been added to your inventory; Exclusive Lightning Shield has been added to your inventory; 2 Exclusive Spell Absorption has been added to your inventory] "Yes, these are the reports Ajira needs. Ajira thanks you, %PCName. Ajira is your friend always. Ajira worked very hard on these potions for you." "Ajira remembers all the good things you have done for her." No, not yet: "Ajira asks you to keep looking, then. They cannot be far from here." stoneflower petals: "Stoneflowers are dark blue and their stems bend towards the ground when they are in bloom. Their leaves look like they are folded among the stems." Telvanni bug musk: "Ajira does not like the Telvanni, but even Khajiit like the smell of bug musk. Try some and see how all the men/women like you." violet coprinus: "Coprinus comes from long-stemmed toadstools which glow blue at night." "Ajira knows that Vindamea Drethan has the Warlock's Ring. Ajira tells you this because Ajira does not like Vindamea Drethan. She is in Ashirbadon, a cave on a small island west of the ruins of Bal Fell." "Have you found the Warlock's Ring? Ajira has told you all she knows." "So you have found the Warlock's Ring. Remember that Ajira is your good friend who shares all her secrets." "Yes, Ajira knows that you are wise and brave and you have found the Warlock's Ring." willow anther: "Willow flowers are reddish and tall, but they do not bend to the ground like stoneflowers. The leaves are long and thin." Despite the in-game storyline about the bet with Galbedir, Ajira will stay an Associate forever while Galbedir is already a Journeyman at the beginning of the game. This page was last modified on 7 February 2018, at 22:01.